With power and versatility, Humvees roll into battle. 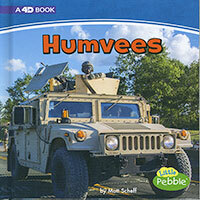 Leave other vehicles in the dust as you learn all about the military's toughest troop of terrain vehicles. Little Pebble books have an ATOS level of 1.0 or below. Bring augmented reality to your students by downloading the free Capstone 4D app and scanning for access to an online article, video, and discussion questions.